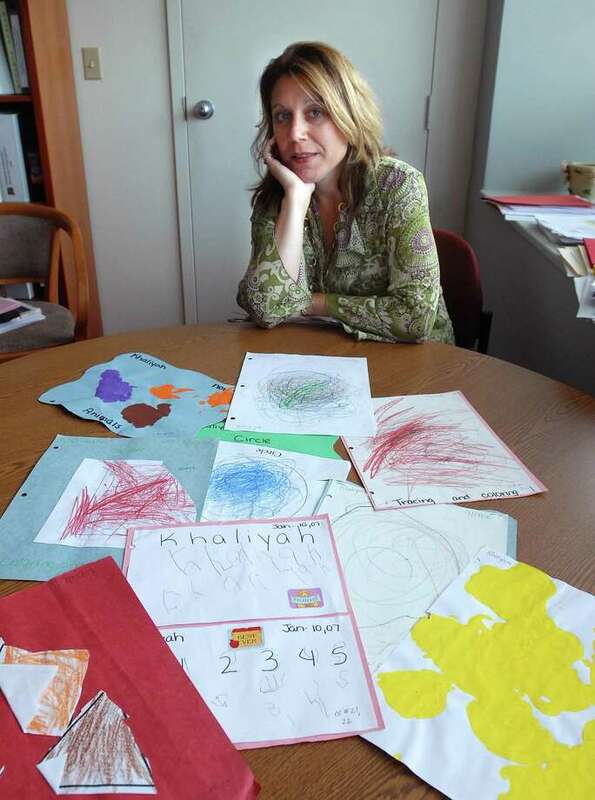 In this photo from 2007, Dr. Tina Mannarino is shown in her office at the Gateway Center in New Haven where she served as the Early Childhood Programs Supervisor for the New Haven Public Schools. WESTPORT — Whenever Tina Mannarino got a perfect report card her dad would take her to spend the day with him at John Jay High School in Brooklyn, where he worked as head librarian. “I loved it. Very early on I wanted to be part of a school system,” Mannarino said. Like her Italian immigrant parents, Mannarino believed, as Horace Mann wrote, that “education is the balance wheel of the social machinery,” and the great equalizer of society and she worked hard in school, and went on to earn a Bachelor’s degree in psychology from Brooklyn College, part of the City University of New York (CUNY). Although Mannarino, 52, planned to attend law school, a mentor pointed out that her analytical mind and commitment to justice for students may lend itself well to school psychology, so she instead enrolled in two master's degree programs at CUNY, one in school psychology and the other in education. “Just from people mentoring and shepherding my way, I ended up in school psychology and loved it,” Mannarino said. For five years she worked as a school psychologist at high schools in Brooklyn and felt she had a big impact for individual students, but became frustrated she could only help one student at a time and decided to go back to school for school administration. Mannarino earned her administration degree from Southern Connecticut State University and her Ph.D. in Education Administration from the University of Connecticut and took her first administrative position with the New London school’s as both a school psychologist and head of the school psychology and social work department. New London’s special education program was not in compliance with state standards and the special education director was unable to perform the job, so the district superintendent soon named Mannarino director. “I was always a systems thinker very early on, so I took over,” Mannarino said, adding she organized the effort to bring the city’s special education program back on track. Seven years into the job and in the wake of 9/11, Mannarino resigned to be closer to her then three young children and home in Branford. She applied for a special education administration position with the New Haven school district, but the city’s superintendent had different plans for Mannarino and asked if she would set up a system of early childhood education for the city. “I love a challenge,” Mannarino responded, and for 13 years she worked to scale up the city’s pre-K program from 300 to 3,000 students. From New Haven Mannarino went to LEARN, one of the state’s regional education service centers where she supported 25 regional school districts and worked for two years before starting work in Westport this summer. “I missed belonging to a district because I really appreciate being able to cultivate relationships with families and with staff and to do work over time so we can see the change together,” Mannarino said. In her role as Assistant Superintendent for Pupil Personnel Services, a position newly elevated from a director role this year, Mannarino will oversee all of the district’s “pupil personnel servants.” This includes overseeing school psychologists, social workers, and occupational therapists as well as all of the programs outside the umbrella of regular education, including special education, gifted and talented, and English as a second language. “In Westport, the challenge is that we have some really high-quality excellent education offerings, yet it’s not one-size fits all,” Mannarino said, adding she hopes to increase opportunities for students for whom a large comprehensive high school may not be the best fit. “I’m very interested in using the arts and innovation to drive success and think out of the box,” Mannarino said, noting she hopes to start an alternative high school in town in the mold of Darien’s Fitch Academy in order to serve students currently sent to programs out of town because Westport school don’t meet their educational needs. Mannarino is also eager to start a job-shadowing program for special education students to work with local businesses and gain skills to help them prepare for life after secondary school. Through all of her work, Mannarino employs a relational lens and seeks to understand students behaviors not as good or bad, but as a form of communication that expresses how they feel in relation to others. “People are hardwired for connection. We’re not meant to be isolated, but things can go wrong early on. When there’s a rupture, that means there’s a break in healthy connection, but the missteps, they are repairable. There’s a lot of hope that all relationships can be repaired,” Mannarino said.